For over a century, Hyden Citizens Bank has served the people of Leslie and surrounding counties. With a commitment to community service and providing the finest financial products and services to the people of Eastern Kentucky, Hyden Citizens Bank has been a true leader in Leslie County. HCB employees 36 full-time employees and 5 part-time employees. Mary Breckinridge came to Leslie County in 1925, and three years later started Frontier Nursing Service. In the years that followed hundreds of healthcare professionals have traveled to Hyden and attended what has become the preeminent school of Midwifery in the country. In recent years, FNU has seen dramatic growth thanks to advances in technology and distance learning.Dr. Susan Stone and her staff are dedicated to preserving the memory of Mary Breckinridge while continuing to provide a high quality education that prepares nurses across the country and across the world, to become competent, entrepreneurial, ethical and compassionate nurse-midwives and nurse practitioners. Celebrating East Kentucky Culture. That is what Our Mountains is all about. From the best in traditional mountain music to delicious, down-home recipes, Our Mountains is dedicated to sharing the best this region has to offer. Hosts Rhonda Brashear, Dean Osborne and Joel Brashear work hard to show that Eastern and Southern Kentucky is truly the best place on Earth! The County Seat of Leslie County, Hyden is one of the most beautiful small towns that you will find anywhere in the Commonwealth. With a population of around 400 citizens, this quaint community is proud to offer a family-friendly environment while still offering strong economic opportunity. A jewel for Hyden is Riverfront Park, a recreational area with activities designed for the whole family. With a large playground, basketball court, skatepark, multiple picnic shelters, a walking track and areas for fishing, Riverfront Park is a true showpiece for Hyden. Other areas of interest include the Mary Breckinridge Statue, Veteran's Square, Hyden Presbyterian Church, The Kentucky School of Bluegrass and Traditional Music, Frontier Nursing University and so much more! We'd love for you to come and visit us here in Hyden! Hospice of the Bluegrass, Mountain Community Office located in Hazard provides end-of-life care to residents in Perry, Leslie, Breathitt, Knott, Letcher, Morgan, and Wolfe counties. We care for patients at home, in long term care facilities, and within the hospital. In most cases a team member can respond within 24 hours of inquiry or referral to begin the admission process. For over 20 years, Hometown Pharmacy has served the people of Hyden and Leslie County. Hometown is committed to offering the best prices while continuing to bring the best in customer service. We work hard to ensure that the medicine you need will be here when you need it. Plus we offer a wide variety of over the counter medication as well. Visit us today and see the Hometown difference! The Leslie County Cooperative Extension part of the University of Kentucky and Kentucky State University off-campus information network. Let us connect you to UK, KSU and the world. We deliver information, education, and solutions. And we grow ideas into better communities, stronger local economies, and healthier lives. Contact us today and see how we can make a difference in your life. 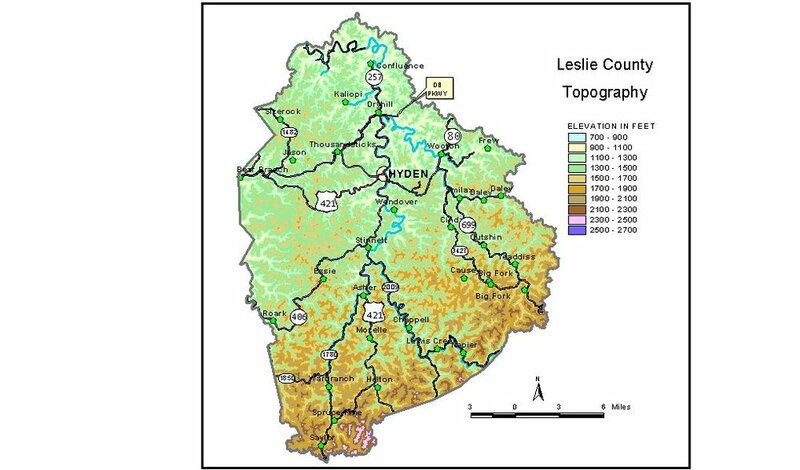 Created in 1878 from parts of Clay, Harlan and Perry Counties in 1878 and is named for Preston H. Leslie who was governor of Kentucky from 1871 to 1875, Leslie County is a beautiful, mountainous land with breathtaking scenery and welcoming citizens. With opportunities for hunting, miles of trails for hiking and riding, rivers perfect for kayaking, canoeing, or fishing and plenty of campgrounds, Leslie County is a paradise for you outdoor lovers! Music fans will love our Hyden Citizens Bank Osborne Brothers Hometown Festival each Summer, featuring students from the Kentucky School of Bluegrass and Traditional Music. Frontier Nursing University is another unique and prestigious institution you will find within our borders. With so much to see and do in Leslie County, we hope you will come and visit really soon! The Leslie County School System is committed to removing barriers to education that will ensure that every student has the best opportunity to become college and career ready without remediation. With over 270 current employees, they are a leading force both in terms of economic force and community action. The Leslie County Board of Education is committed to betterment of our children and our county. Grace Community is a Christian Centered health-care provider that treats the whole patient and the whole family. The Housing Development Alliance is an equal opportunity housing provider. We work with a variety of homeowners, including but not limited to young working couples with children, single parents, persons with disabilities and elderly persons. The Housing Development Alliance serves people at or below 80% of the Area Median Income in Perry County, and parts of Breathitt, Knott and Leslie Counties. Quality Food in a friendly atmosphere, Red Light Cafe is Hyden's best choice for a sit-down meal. Specialty sandwiches, daily specials and amazing deserts are just some of the wonderful things you will find at the Red Light. We are also available for catering as well. Come in and see what's cookin' at the Red Light!